This is Wordless Wednesday. Yee Haw!! Just to be VERY clear here... I'm NOT exactly infatuated by the spiders themselves so much as their beautiful work of art. Not one alike. Isn't it amazing? Capturing it takes the perfect moment, which can be a little tricky. Here are the few I've managed to get. Thanks to my neighbor for preserving a couple and allowing me to drag my camera over. Now I want you all to think of cute Charlotte from Charlotte's Web as you scroll your mouse down the page. OK? Ok, let's get this WW party started. Add your link below and then head over to some of my other bloggy friends... Kristi at Live and Love Out Loud, Angie at seven clown circus, and Susan & Janice at 5 minutes for mom. AAhhhhhh! I think your son's bug "love" is rubbing off! LOL! spiders give me the creeps but great captures. my favourite is the third one. As for the photos, I love the third one and the last one. Total perfection! I too am fascinated by the beauty of spider webs. They are artists, indeed. Ummm, ewwww! Those are pretty great pics though. I need to get my spidy pics up one day. I am not a spider fan, but as you know my son is a huge fan of them. So I too have been noticing how amazing their webs are and how many different types there are. Funny how when your kids have a love for things like this you take time to really look and try to understand what the appeal is and when you do that it is nice to find something beautiful about things like spiders LOL. BTW your shots are amazing, I don't have a good enough lens to get the kind of shots you do. I am going to have to ask for a new lens for Christmas LOL! I love the 'web' pics, but they just NEVER seem to work out for me... Oh well, more patience and practice is need I suppose! Mine is up as well at AussiePomm (Spring Walk), have a great WW!! Spiders are fascinating little creatures. I always feel like I've won the jackpot if the web I photograph comes out well and in-focus. :) Great shots! awesome shots! what beautiful detail! LOVE these! My last post was about a web...love the webs, not the spiders. Really beautiful photos. For some reason, I'm not seeing the linky so here's my link. I'll check back again a little later. I cannot believe the closeup of that spider. I hate spiders but think they are so facinating and the webs they make are works of art! Beautifully captured as always! These pictures are great, I have to agree, happy spider thoughts no...but great pictures!! Very cool shots Alicia. Love the composition and contrast of the first photo. Some gorgeous webs, but that middle photo made my skin crawl! Great pics...no way I would be able to do that - I HATE spiders. Happy WW!!! I love the 3rd one. Beautiful spider and cool shot. ok you know that I love your blog but this is one post that I quickly scrolled through and barely glanced at it. I usually don't mind spiders but when it's this up close and personal, it gives me the heebie jeebies!! 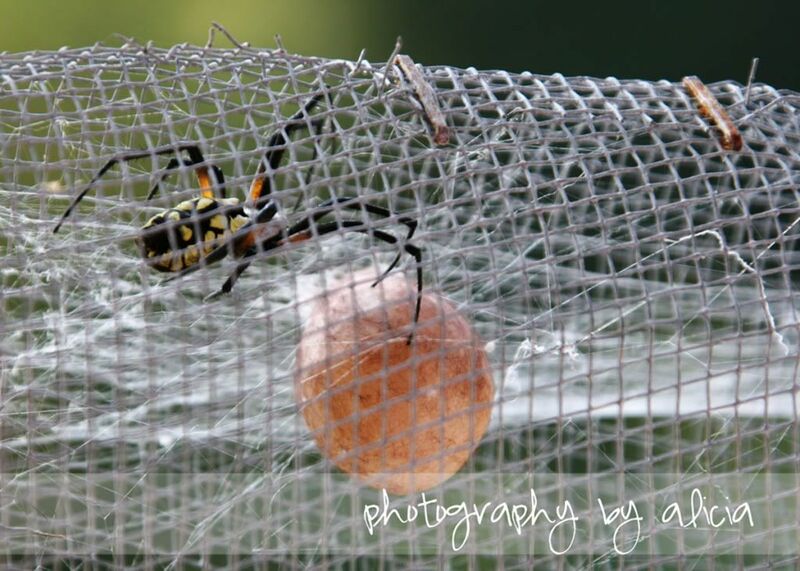 Cool pictures, although the spiders still make my skin crawl a little just looking at them! Ummm, let me just say, EWWWWW!!!! Just beautiful photos! thanks for sharing! Some stunning photography. You are very talented! To say I HATE spiders would be an understatement. But these photos are beautiful! Great photo.. Love the web! I absolutely love spiders...not crawling on me or even near me, but they are facinating creatures for sure. I love the webs..amazing. Wow! Not a spider fan, but the photos are just lovely. That last one is awesome, but eeek i feel like something is crawling on me!! My son loves spiders, I'm going to have to show him these photos. I, on the other hand, not the biggest fan of spiders. Still, love the photos though, thanks for hosting! Love the close up of that spider. 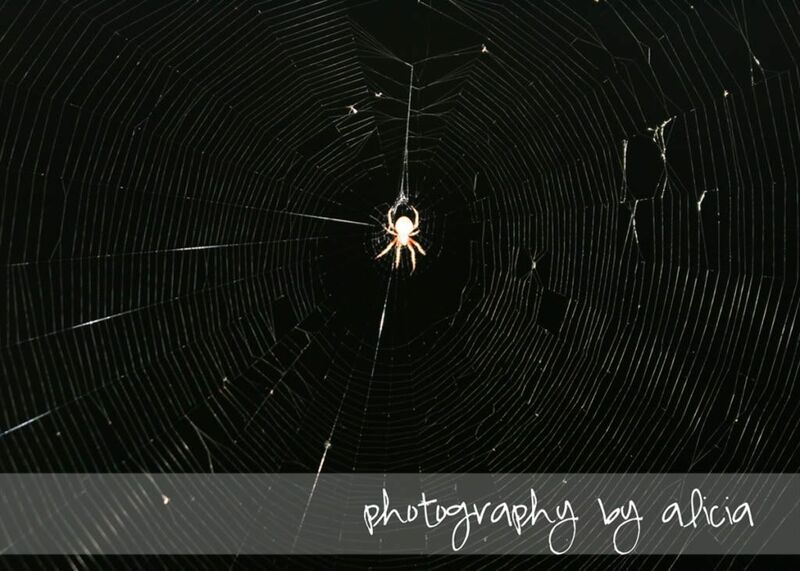 Even though spiders creep me out, those are still some really cool pictures. 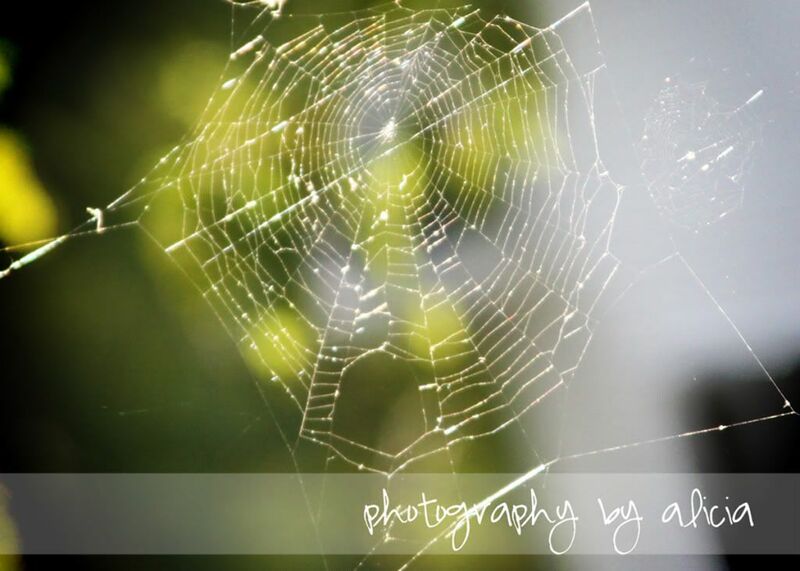 Spider webs are definitely works of art. Thanks for the linky! Have a great day! These are both beautiful and disgusting. that is amazing how you capture both emotions! I can hardly bring myself to use "cute" and "spider" in the same sentence BUT these pictures almost make it seem possible! Nice! Wow! I hate spiders, but these pictures are really beautiful! You are very talented!!! You did great! I've tried to capture a couple webs, but they are never that clear. Love it! Beautiful shots, but seriously gave me the willies. Spiders are NOT my friends. Even if they do talk and try to save cute pink pigs! Ok, how brave are you??? 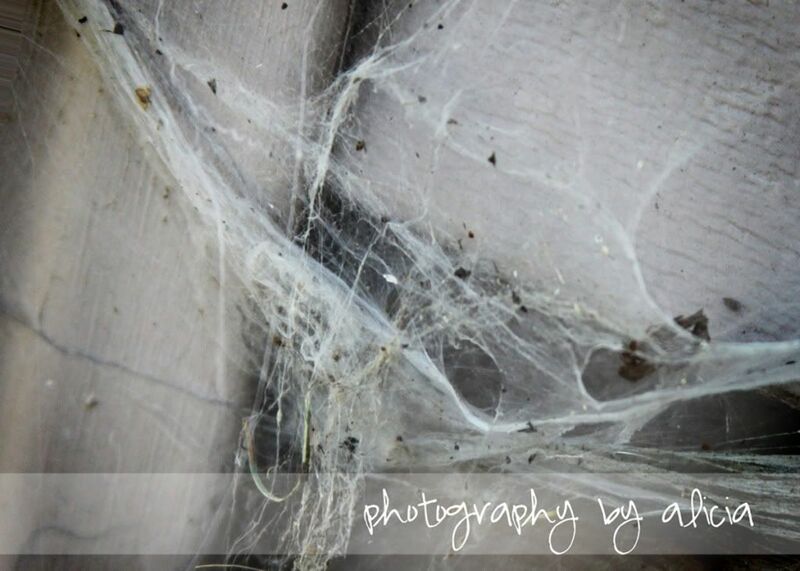 I do love spider webs but I'm terrified of the things that make 'em!!! Great shots. Maybe if they talked to me with Julia Robert's voice I might like them more. Great pictures but now I'm totally creeped out! The web is magnificent! Spiders really creep me out due to their jumping abilities but I can see the beauty in these shots! That is some great pictures! You captured that beautifully! What lens did you use? Don't know when spiders and webs have looks so amazing! Beautiful! I agree! I am not a fan of spiders AT ALL, but they do amazing work. I think my all time favorite spider web scene is when the dew is dripping from the web. I think it is beautiful and brings out the best detail. Garden spiders don't actually bother me but that cacoon thing they do....disgusting!!! We had one outside our patio door in our walk out basement and I wanted to puke every time I saw it! Oh, wow, Alicia! So very neat! Loving these shots! those are really great shots!!! These are really beautiful photos. And I love Charlotte. Please don't post any snakes though. I can't handle them. Great shots! Spiders are quite fascinating. Thank you for the linky too! Wow, cool pictures, but totally freaky! Really beautiful and creepy all at the same time! I really hate spiders but in picture form, they are okay!! These make me want to try and get up close and personal to get some shots like these!! I actually got some great spider pictures last week too! I just need to upload them and post to my blog. 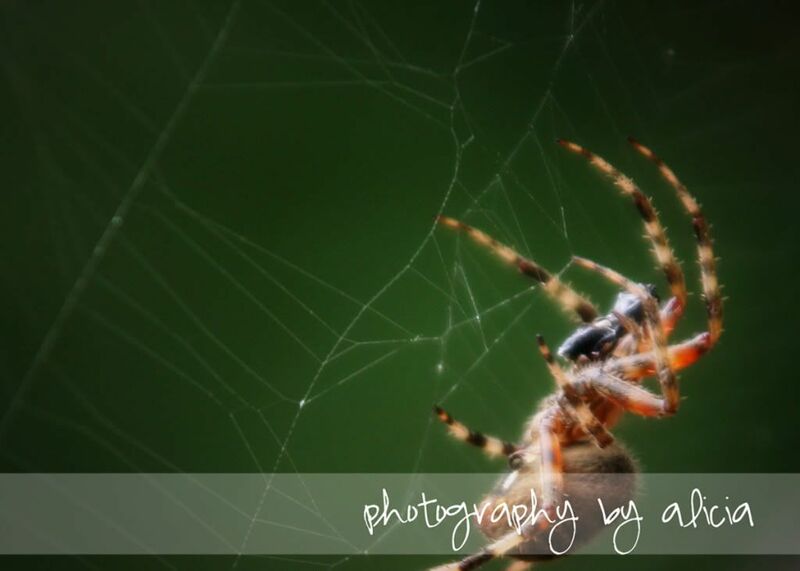 I absolutely HATE spiders, but love to photograph them. They are cool for that purpose! Pure talent!! These are amazing. Today, I am participating in my first Wordless Wednesday, but my shots are taken with a crummy phone. Doh! Ok, I was a tad bit scared to open this entry with the spiders but it wasn't bad at all! I don't do well around creepie crawlies. LOL Great photo!! This was just absolutely fun! I could not believe someone else did spiders today, too!!! Thanks for linking me up! :) and I love your web and spider shots. I have taken quite a few of them myself. :) such fun! This year we are being over run by spiders, so I'm not overly thrilled by this close up look! But how can one not marvel at such ingenuity? Your photos are absolutely excellent. What cool shots! Is that an egg sack? Amazing! That first one looks the spider we found just off our back porch, and I'm sorry, but there was nothing Charlotte's Web about the others. Haha. Ehh, I hate spiders! Yuck! But those pictures are amazing! I love how you captured the spider web. I am new to your blog and following you. I would love if you stopped by my blog and followed me.